I stand under the lemon tree that grows in the courtyard of our house and check my shopping list. Guests are coming this evening, and I am making a traditional Moroccan meal for them to enjoy! Satisfied that I haven’t forgotten anything, I grab my purse and leave. 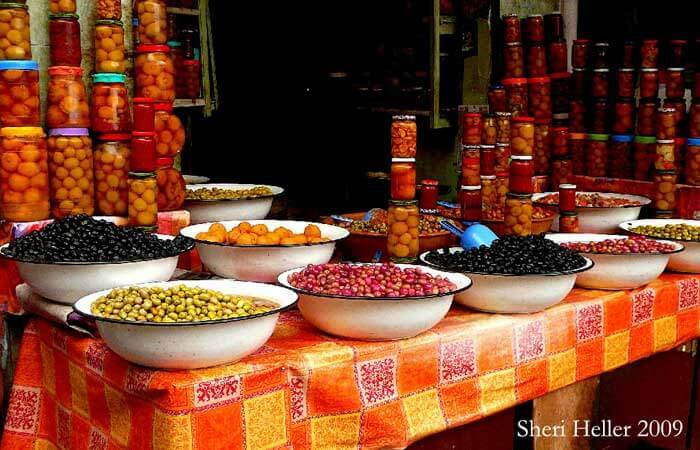 One of the best things about living in Fes, Morocco is that shopping is easy. I can go out and get everything I need for an extravagant meal in one street. I check my list. At the top of Tala, which is the Arabic word for street, you can find your meat. I can hear the women bickering with the shop keepers, bargaining to get the lowest price. I pass the butcheries with the animal heads hanging from hooks and walked over to a man standing behind a clean white tile counter. In the background is a large cage full of squawking chickens unaware of their fate. I ask the shopkeeper for one chicken and then leave to buy some bread. I know that when I return, the chicken will be cleaned and ready for cooking. My favorite place to buy khobz, or Moroccan bread, is at a simple stand that is run by a Moroccan woman. Although her face is covered in a veil, I can see that she is smiling as she greets me by the twinkle in her eyes. As always, the bread is freshly baked, but this morning I am extra lucky – the bread is warm. After paying and thanking her, I return for my chicken which is double bagged and ready. I need the chicken to make tagine, a classic Moroccan meal. Since tagine is like stew in that it has a thicker broth, it is customary to use the bread to eat it in place of silverware. Item # 3: Veggies: Cucumber, Tomato and Onions. Satisfied with the prices, I pick out each of the vegetables and give them to the boy to weigh. I’m using the cucumber and tomato to make a traditional salad that consists of finely diced tomatoes and cucumber with a little lemon and parsley. The onion will go in the Tagine. You get your fruit at the same place. 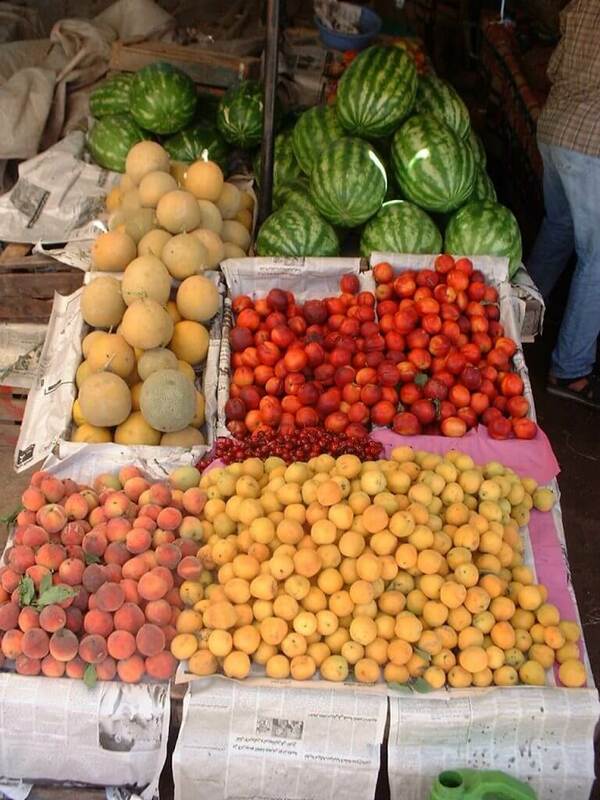 There are few places with fruit as fresh and cheap as in Morocco. The trick to this is to buy what is in season. Currently, all the items on my list are in season. The lemons are for the tagine and the salad. The rest are for dessert. Oranges are in abundance, which is always exciting because Morocco is famous for its juicy oranges. It is traditional to use fruit as dessert by chopping it up and arranging it on a platter. Just before serving, I will dust them with cinnamon sugar. I make my purchase and then move on. I can find mint in a cart by the side of the road. They sell it in bunches and you can smell it before you see it! In the same place, you can buy rose water and jasmine in case you are baking an extravagant Moroccan treat. I lift up the deep green plant and enjoy its fresh scent. I always buy a bunch to make Moroccan mint tea which is a must have for every proper Moroccan meal. It is usually served after the meal with handmade pastries or cookies that you can buy at the store. The olives are located across the street and are a perfect picture opportunity for all who pass. The olives are piled into domes above their baskets and have multiple flavors and colors. Some have a zingy lemon flavor and others have spice from hot peppers. I buy them by asking for 5 dirhams (about fifty cents) worth and they fill up a bag and give it to me. 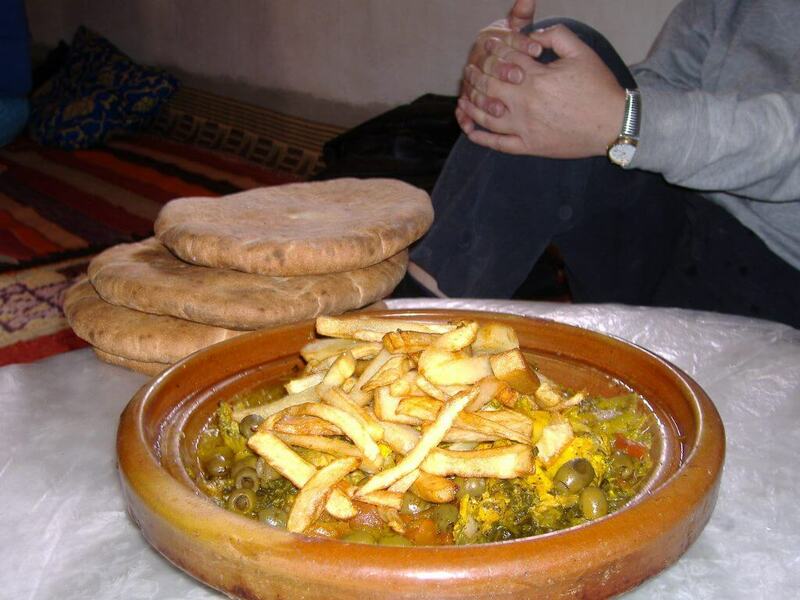 I will arrange these around the tagine, which is served in a dish in the center. With all the ingredients for a perfect meal in my hands, I walk back up the street to my house where I will begin to cook my meal.